← Is it a mouse, is it a cat? Dr Andrew Hillier has been looking at the unpublished letters of a British Student Interpreter, later Consul, Walter Clennell. 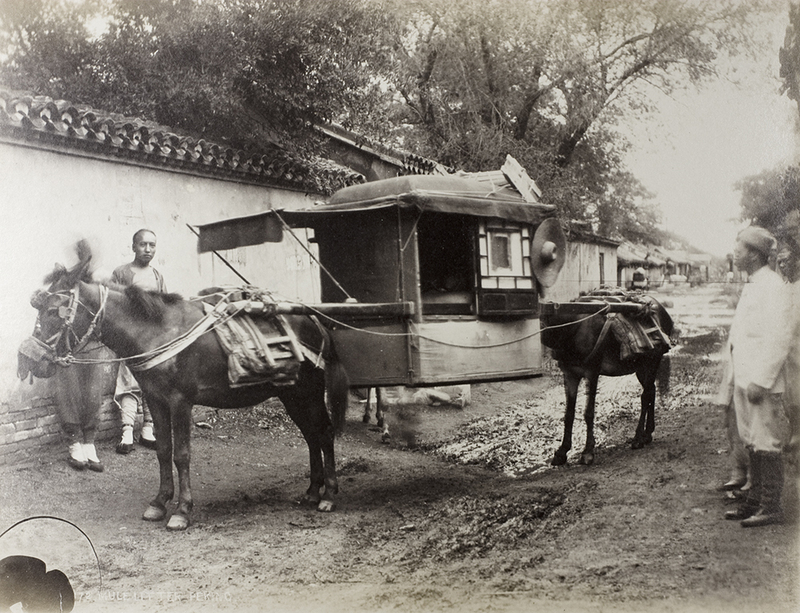 The correspondence highlights the importance of photography to Legation life in Beijing in the late 1880s. Andrew recently completed his PhD at the University of Bristol. 2. Street in Peking. Photograph by Walter Hillier. Probably taken in the late 1880s before Hillier’s appointment as Consul-General to Korea in 1890 (Royal Geographical Society, SOOO25562). 3. 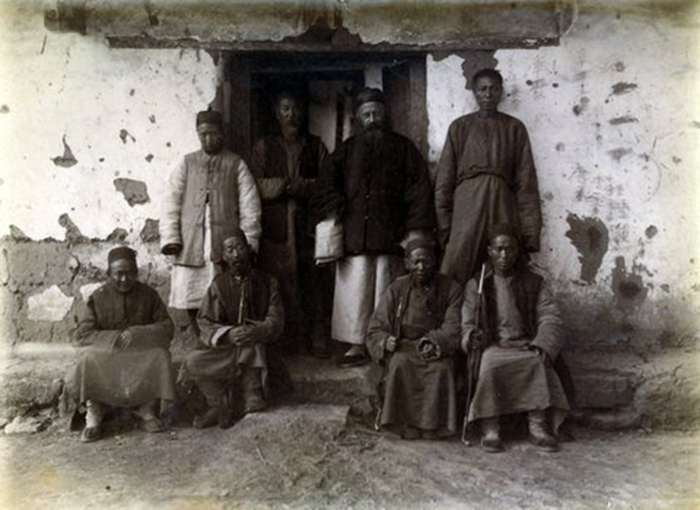 The Mission Station at Szu ku-shan: Father Braun and some of his flock, 1890. Photograph by Guy Hillier (Author’s collection). 4. Guy Hillier’s travelling companion, Gordon, warming himself at the fire. Photograph by Guy Hillier. (Author’s Collection). Clennell’s letters reflect not only a general enthusiasm for photography amongst the Legation staff but also the way the hobby cemented what was obviously an easy-going atmosphere at all levels. The Minister, Sir John Walsham, and his wife seem to have had an unusually relaxed approach, there is little sense of hierarchy and family life thrived, with the Legation children being both seen and heard, and pastimes, including skating, shooting, amateur theatricals and fancy dress balls, being captured in photographs. 5. 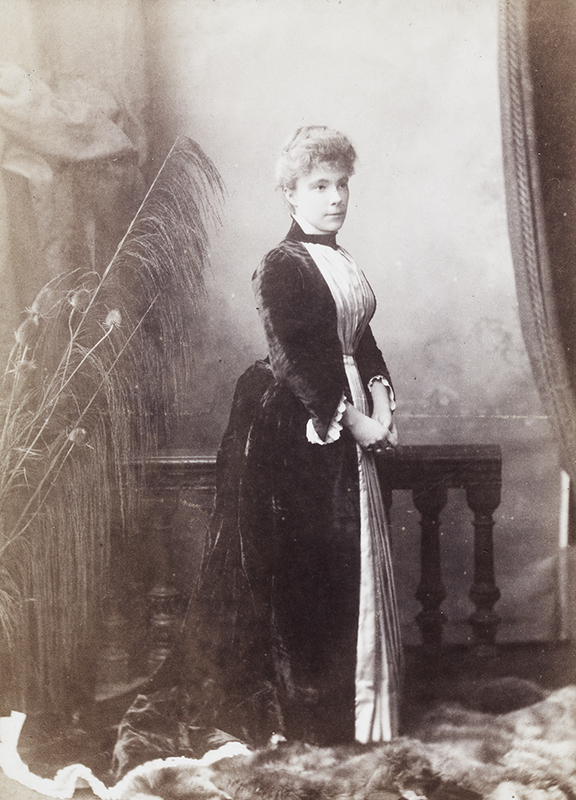 The ‘jolly and communicative’ Gina Marshall Hole, photographed shortly before leaving for China in 1888. She later married Herbert Brady. Photograph by Boning and Small. Andrew Hillier Collection, Hi-s143, © 2014 Andrew Hillier. 6. 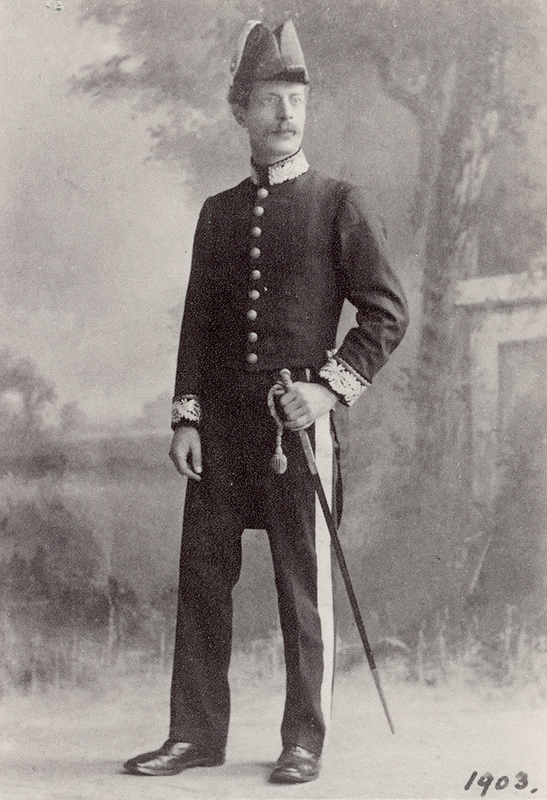 Consul Clennell, 1903. (Private Collection). However, this relaxed atmosphere would not last, China’s defeat by Japan in 1895 heralding a more aggressive approach by the Western powers, which ultimately led to the Boxer Uprising. Whilst those events would also be recorded in detail, the images would be of a very different character to the ones which the young and enthusiastic Walter Clennell sent to his family in his early days in Peking. [i] Letter, Walter Clennell to his sister, Trixie (Beatrice), 21 December 1889, Walter James Clennell, ‘Destination Peking: A Young Man’s Journey into China, 1888 – 1889’, unpublished manuscript, 2008 (Private Collection), at p. 341. I am very grateful to Jonathan Clennell for allowing me to draw on these letters and to reproduce the photograph of Walter Clennell. [ii] Letter, Clennell to Trixie, 22 February 1889, at p.186. [iii] For details of Child’s life and work see Regine Thiriez, Barbarian Lens: Western Photographers of the Qianlong Emperor’s European Palaces (Amsterdam: Gordon and Breach Publishers, 1998), pp.75-84, Terry Bennett, History of Photography in China: Western Photographs, 1861-1879 (London: Quaritch, 2010), pp. 56-78; see also Historical Photographs of China, https://www.hpcbristol.net/photographer/child-thomas. [iv] Helmut Gernsheim in collaboration with Alison Gernsheim, The History of Photography: from the camera obscura to the beginning of the modern era (London: Thames and Hudson, 1969), pp. 405 and 413. [v] ‘Christmas Show at the Stores’, North China Herald, 13 December 1889, p.726 and see also 20 December 1889, p.758. I am grateful to Terry Bennett for this reference and for his comments generally. [vi] Letter, Clennell to his brother, Harold, 12 February 1889, at p. 182; see also https://www.hpcbristol.net/visual/na01-68. [vii] Herbert Francis Brady, Bo Ian Zhonghua tu zhi (Pictorial Journal of Viewing China), c. 1873-1906, Getty Research Institute, http://primo.getty.edu/GRI:GETTY_ALMA21127096190001551; cf. Jeffrey Cody and Frances W. Terpak, Brush & Shutter: early photography in China (Exhibition, 2011: Los Angeles, Calif., J. Paul Getty Museum (Los Angeles, Calif.: Getty Research Institute, 2011), p.40 and Plates 22 (Kiang-si Guild, Hankou) and 23 (Chinese Actors and Fire Brigade, Peking). [viii] Touying qiguan; see Chen Shen et al., Zhongguo shying shi (A History of Chinese Photography) (Taibei: Photographer Publications, 1990), pp.65-66, Nick Pearce, ‘A Life in Peking: The Peabody Albums’, History of Photography, 31 (2007), pp. 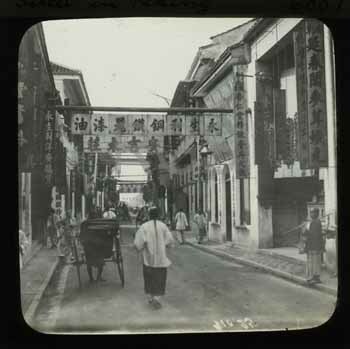 276-293 and Bennett, History of Photography in China, pp.37-55; see also https://www.hpcbristol.net/photographer/dudgeon-dr-john and https://www.hpcbristol.net/visual/os03-056. 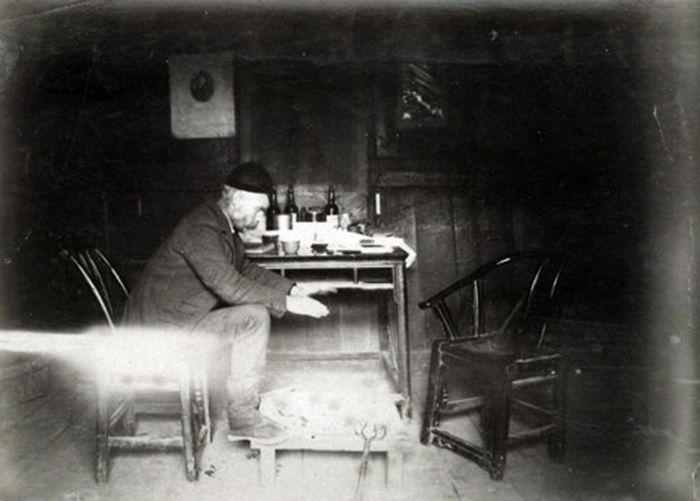 [ix] Letter, Clennell to his mother, 28 December, 1888, at p.143. [x] See Collection of Sir Walter Hillier, Royal Geographical Society Picture Library. [xi] Guy Hillier, ‘A Mountain District of Central China’, Journal of the Manchester Geographical Society 6 (1890), pp. 370 – 380. For the Hilliers in China, see Visualising China Blog, my post, 22 September 2016. [xii] Clennell to Harold, 5 December 1888 at p.124. [xiii] Letter, Clennell to Trixie, 26 February 1889, at p.186. [xiv] John Thomson, Travels and adventures of a nineteenth century photographer, with an introduction and new illustration selection by Judith Balmer (Oxford: Oxford University Press, 1993); cf. Robert Bickers, The Scramble for China: Foreign Devils in the Qing Empire, 1832-1914 (London: Allen Lane, 2011), pp. 218-20). This entry was posted in cross-searching, Family photography, Guest blogs, History of photography in China and tagged Beijing, Consular Service, Legation, Peking. Bookmark the permalink.